Shot this at the beginning of the month when I met Bear_Music out at the Marin headlands. He kept wondering why I was shooting horizontal, when the landscape had some strong vertical lines. Well Robert, here's the answer! 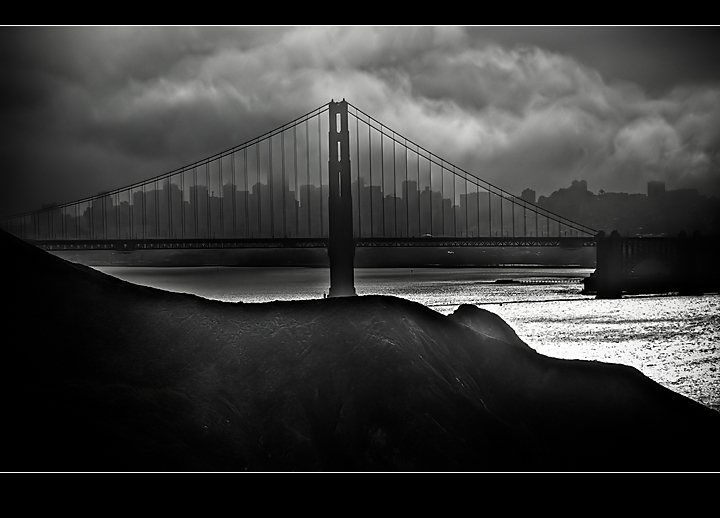 I was trying to bring out the city skyline behind the golden gate bridge. Not easy on a foggy, flat day. This is tonemapped from a single RAW images. I actually liked it better using this single shot tonemap than a tonemap with multiple bracketed files. This shot was the most underexposed of the set, which brought out the detail in the clouds. I decided to let the foreground go black, so didn't need the detail in the other shots. I was sure that I'd find a better shot later in the month, but ended up going with this one because its a little unique, and I think has a better chance to do well -- or bomb entirely -- in a Free Study. Hoping for a 6+ score here, but think its about a 6.2x max. Good chance it will end up down in the 5.4x range as well. I definitely went a bit overboard on the processing on this one, and recognized the issues with halos and the harsh light on the water pointed out by some. Fact is, the light was pretty flat and the original of this shot is as well. Had to work pretty hard to pull that detail out of the clouds, while preserving the bridge and the buildings which were the focal point of the image. That said, both the water and the foreground were pretty tough to deal with and distracting in the final image. In the entry, I decided to let the foreground go black, except for the brightest spots pulled out by the HDR processing -- I figured some would like, and some would hate. Oh and for those that hate the frame, me too, sort of. I originally had just black bands top and bottom, then added the white line out of concern the all black frame bled into the image and might be deemed to be a rules violation, since it wasn't clear and distinct enough. I do like the thicker border on the bottom though to give more weight to the image. And I've found, with landscapes in particular, a right or left edge border tends to constrain the sweep of the image, so I've been leaving them off in most wide landscape shots. Hi Dennis, this was one of my high scores. Nice work. The light is sublime, and I love the way the city appears encased in the bridge. Wow, the bridge, clouds and skyline are amazing and look like a painting. But something is wrong with the foreground that detracts from the rest. Great work overall. Love the shot. Hate the frame. It really has an ethereal property to it that just pops. I perhaps would have brought the light on the near hill down just a little. I like the precision (but don't much like the frame on which the photo depends). None-the-less, one of my favourite images from this challenge. The clouds and the silhouettes of the city through the bridge are awesome. I don't like the light areas on the rocks in the foreground or the uneven border at the top and the bottom. Love the concept, subject, choice of BW and composition. The PP needs to be cleaner in my opinion, too much halo outlining the hillside, and the water is, well, I just don't know! The vignette is too heavy (that's a personal opinion!). I would love to see a more simple processing of this image after the challenge if you don't mind the effort. I see a wonderful potential in this photograph. Proudly hosted by Sargasso Networks. Current Server Time: 04/23/2019 12:05:52 AM EDT.